White paper on crime 2001 Part 1/Chap.1/Sec.6/2. Fig. 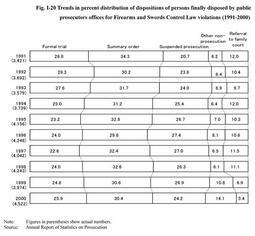 I-20 shows the trends in percent distribution of dispositions of persons finally disposed by public prosecutors offices over ten years from 1991 to 2000 for Firearms and Swords Control Law violations. Suspended prosecution and other non-prosecution together accounted for about 30% of the total number of dispositions. The data obtained from the Criminal Affairs Bureau of the Ministry of Justice show the term of imprisonment sentenced in ordinary first instances in 2000 for Firearms and Swords Control Law violations involving guns (referring to handguns, rifles, machine guns and cannons for the purpose of this section), live ammunition for handguns, and handgun parts. A total of 154 persons were sentenced to imprisonment with labor (including 44 persons who were granted suspension of execution of the sentence). By type of incident, 104 persons were convicted for"possession of a handgun and live ammunition" (including 97 persons convicted for"multiple possession") and 22 persons for"simple possession of a handgun". By a term of imprisonment, 55.2% of the convicts were sentenced to three years or more but less than five years, 26.6% to one year or more but less than three years, 11.0% to five years or more but less than seven years, and 4.5% to seven years or more but less than ten years. In 2000, 8 persons saw their punishment reduced for the reason of surrendering the handgun, etc. to the police. By a term of imprisonment, 4 of them were sentenced to three years or more but less than five years and 3 persons to one year or more but less than three years. Fig. 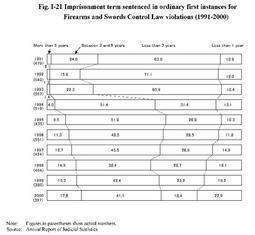 I-21 shows the term of imprisonment sentenced in ordinary first instances over the last decade for Firearms and Swords Control Law violations. A majority of the convicts have been sentenced to imprisonment of three years or more since 1994 when a partial amendment to the Firearms and Swords Control Law and the Arms Production Law in 1993 substantially augmented statutory penalties for offenses involving handguns, etc.